I am so excited to have my Rachael Ray magazine subscription started again! I never watch her show, but I have found many good recipes in her magazine and it's fun to be able to actually flip through and look at the different recipes instead of finding them online like I usually do. Anyway, these were a big hit! I especially loved them and have eaten them non-stop the past couple days. 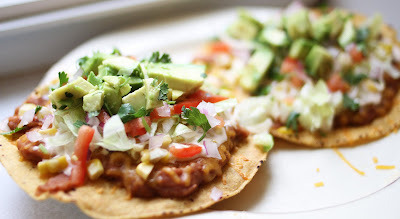 They are so much better than a normal tostada, especially with the Chipotle cream sauce, but still so easy to make. They are great for lunch too and once you have prepared them, you can keep all the different toppings in the fridge and they are ready to assemble quickly whenever you want them! *Preheat an outdoor grill or preheat a broiler to high and position a rack on the second shelf. Dress the corn with a little oil and season with a sprinkle of chile powder, salt and pepper. Grill or broil the corn, turning occasionally, until tender and evenly charred, 12 to 15 minutes. Invert a small bowl in a larger bowl. Using tongs, remove the corn from the grill or broiler and steady the ears upright, 1 at a time, on the inverted bowl. Using the back of a knife, scrape the kernels from the cobs. Dress with the lime juice. *In a small saucepan, bring the cream, chipotle, adobo sauce and lime peel to a boil over medium heat on the stovetop only (cream requires a babysitter and the grill heat is too high). Lower the heat to a low, slow boil and cook until reduced slightly. *In another small saucepan, combine the refried beans and 1/4 cup water on the grill or over medium-low heat. Heat through and remove from the grill. *Serve 2 tostadas per person. Top each tostada with a mound of corn, the chipotle cream, the remaining cheese, the lettuce, tomatoes, onion, pickled chiles and cilantro, if using. I came across this fun new food blog one day, Homesick Texan. There are many new recipes I can't wait to try and this was the first one that caught my eye. It was a little labor intensive, but you could cut down the prep time by using canned chicken and store-bought chicken broth. The end result was really yummy...even on a hot summer day :-)! -Clean and rinse your chicken and place in a large stock pot. Add water, onion, 8 cloves of garlic, carrots, celery, bay leaves, epazote and whole cilantro stem. Add salt and pepper to taste. Bring to a boil and then simmer for an hour and a half, occasionally skimming the foamy scum off the surface. -Remove chicken from pot and turn off the heat. After it’s cooled, remove fat and pick the meat off the bones and either shred or cut into bite-sized pieces. Sprinkle chicken with salt and pepper to taste. -Take cooled broth and strain and throw out the vegetables as they’ve done their duty. Now you need to remove the fat from the broth. If you don’t have a preferred way of getting rid of the fat or lack a gravy separator, you can try the plastic bag method. Take a quart-sized plastic storage bag, pour some broth into it. You will see the fat rise to the top. Snip a bottom corner of the bag and drain the broth, stopping when you get to the fat layer. (You will probably have to do this in batches). -Place the broth back into the pot and add the shredded chicken and lime juice. In a blender, add the can of Ro-Tel, sliced jalapenos, chopped cilantro and garlic and blend. Add puree to the pot. Now add the cream. Add salt, black pepper, cayenne and cumin to taste. Bring to a boil. 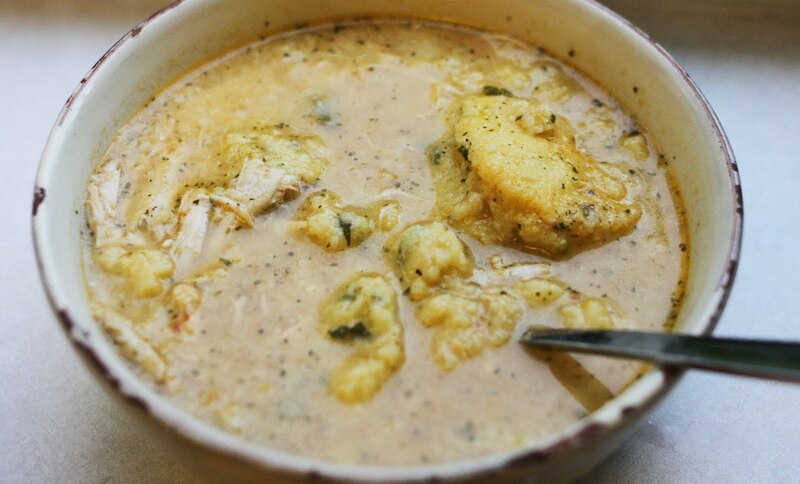 And while the soup is coming to a boil, make the cornmeal dumplings. -Sift together the cornmeal, flour, baking powder and salt. Beat the milk with the eggs and add to the dry ingredients. Stir in the melted butter, cilantro and jalapenos. -When soup is boiling, turn heat down to low and gently drop the dumpling batter into the pot, one tablespoon or so at a time. Do not stir. Place lid on top and steam dumplings for 20 minutes. -Ladle the chicken and dumplings into bowls and sprinkle cilantro on top. Serves six to eight. Notes: If you want a thicker broth, feel free to add some flour. I'd add it slowly, a quarter cup at a time. I was on the hunt for another pork chop recipe and thought this one from Tickle My Palate sounded awesome. It was SOOO good...a hit with the whole family! It wasn't hard to make and was a great combination of flavors. I made a wild rice mix to go with it and thought it was perfect. I ate the leftover side salad with chips like a salsa and it was delicious. Definitely give this one a try this summer! *Pour on meat. Ready to grill after marinated for an hour. The girls LOVE cheese enchiladas. Whenever we go to Mexican restaurants that is what they get and they eat it ALL. Since they never seem to like any of my enchiladas very much I decided to try and make the kind they prefer. I found this website, Delicious Mexican Recipes, and used this one as a guide. You don't really need much of a recipe for cheese enchiladas I realize, but these were restaurant good (in my opinion :-). The girls, of course, didn't eat them as well as they do at the restaurants, but what can you do? Add a hand full of the grated cheese and sprinkle some onion down the center of one tortilla and roll it. Do this by grabbing one end of the tortilla and bringing it 3/4of the way over to the other end. Tuck and roll the tortilla. Pick up the cheese enchilada with your fore fingers on the bottom where the seam is. Let your pinky fingers cover the ends of the enchilada to keep the cheese from falling out while you move it to an oven proof dish. Using a ladle, pour hot enchilada sauce over the top of the cheese enchiladas and let plenty of sauce run down the sides. Remember, the sauce is what makes it! Sprinkle more cheese and onion on top in the desired amount. I was on the hunt for a new vegetable side to try when I saw this recipe on Peachtree Cooking. These are SOOO good! All I wanted for dinner that night were these beans. They are definitely my new favorite side and so easy to make too! I've already decided I'm making them again next week :-)! Combine soy sauce, oil, and sugar in small bowl. Spray wok or 10" skillet with cooking spray, or small amount of oil. Add garlic, cook for one minute. Add green beans, stirring constantly for 2 minutes. Add soy sauce mixture, continue to stir and cook a few more minutes until beans are brown and yummy (but not soggy). I finally got a food processor and this was a great recipe to try it out for the first time! I saw this recipe on Dish Delish and thought it would be a perfect summer meal. It was a hit all around! All the kiddos liked it, I loved it and even Mike thought they were good. We'll definitely be making them again!!! Place chickpeas and onions in a food processor. Pulse until almost smooth. Add the parsley, cilantro, salt, red pepper, garlic, and cumin. Process until well-blended but not pureed. Remove chickpea mixture and place in a bowl. Sprinkle in the baking powder and flour, and gently mix. Add enough flour so that the dough can form a small ball without being too sticky. Refrigerate, covered, while you heat the oil and chop the veggies. Mixture can easily be made several hours ahead of time. Using a small cookie dough scoop sprayed with Pam, form the chickpea mixture into balls about the size of walnuts (you should have about 16-18 balls). Flatten between greased hands, until each ball becomes a 3 inch circle. Heat 2 inches of oil to 350 degrees in a deep pan (I always use a candy thermometer to make sure my oil temperature stays consist ant) and fry 1 ball to test. If it falls apart, add a little flour. Then fry about 5 balls at a time for a few minutes on each side, or until golden brown. Drain on paper towels and sprinkle with salt. Place 2 cups of the flour into a large mixing bowl (or Kitchen Aid). Pour the boiling water over the flour, and stir till smooth. Cover the bowl and set the mixture aside for 30 minutes. This process will cook out some of the starch, making the bread very soft and pliable. Divide the dough into 8 pieces (each around 3-4 oz.-- I use my kitchen scale for this), cover, and let rest on an oiled surface for 15 to 30 minutes. Roll each piece into an 8-inch circle, and dry-fry them (fry without oil) on a griddle or frying pan over medium heat for about 2-3 minutes per side, or until they’re flecked with brown spots. Adjust the heat if they seem to be cooking either too quickly, or too slowly; cooking too quickly means they may be raw in the center, while too slowly will dry them out. Stack the cooked bread in between a soft, clean towel to keep them warm and soft. Serve immediately, or cool before storing in a plastic bag. My hair lady (as I affectionately call her...and who better come out of hair styling retirement soon!) emailed me this chicken recipe that she found on Our Best Bites. Her husband claimed it was the best chicken he has every had, so I just had to give it a try. And it was pretty dang good! Thanks for passing it on Shannon :-)! We'll definitely be making it again...I can't wait to have the leftovers on top of salad for lunch tomorrow! -Combine the rub spices in bowl and mix well. -Use kitchen shears (or a pair of clean scissors) to trim off any excess fat from the chicken pieces. Pat dry. Drizzle oil over chicken and rub in with your hands to lightly coat all the pieces. Then toss chicken with the spice rub to coat all sides well. Use your hands and get in there! Grill chicken for 3-5 minutes on each side, until cooked through. -While chicken is cooking, warm honey in the microwave so it's not so thick. Add the vinegar and combine well. Reserve 2T honey glaze for later. Take the rest and brush on chicken (both sides) in the final moments of grilling. -I'm gonna warn you that this can make a hot mess, literally. It's sugar, and it's gonna drip. But the smelly smoke is worth it for a minute or two. Just leave your grill on for a few minutes after the chicken is done to burn off any excess glaze. It's totally worth it once you taste this stuff. I got a great deal on 2 humongous watermelon a couple weeks ago and was worried about being able to use it all fast enough. When I saw these in Cooking Light I thought they'd be perfect...not to mention the girls had been waiting all winter to use a princess popscicle maker they got at Christmas time. The original recipe has mint in it, but I was worried the girls wouldn't like it so I skipped it. We all LOVED how they turned out...sooo refreshing on a hot afternoon! I couldn't resist trying these cookies out when I saw them in an old Rachael Ray magazine...peanut butter, bananas...AND gluten-free :-)! I couldn't stop eating them, so it was a good thing it didn't make tons! I'll definitely make them again, they were easy, tasty and pretty too! 1.Position racks in the upper and lower thirds of the oven and preheat to 350°. Line 2 cookie sheets with parchment paper. Using an electric mixer, beat the egg whites with 1/8 teaspoon salt at medium-high speed until stiff peaks form, about 3 minutes. Gradually mix in 1 1/2 cups confectioners' sugar and beat until thick and glossy, about 2 minutes. Fold in the peanut butter until just blended. 2.Using a 1-inch ice cream scoop, place 16 mounds of the cookie mixture evenly on each prepared cookie sheet. Bake, switching and rotating the sheets halfway, until golden, 20 to 25 minutes. Let cool slightly on the sheets, then, using a metal spatula, transfer to a rack to cool completely. 3.Meanwhile, using an electric mixer, beat the butter with the remaining 1 1/2 cups confectioners' sugar and 1/8 teaspoon salt on medium speed until fluffy, about 5 minutes. With the mixer on low speed, beat in the banana and lemon juice. 4.Spread the banana frosting on the cooled cookies and sprinkle the peanuts on top. I wasn't planning on making my own salsa for Preston's party, but when I went to The Pioneer Woman's site looking for a yummy dessert to try (which I found!) I saw this and thought, well, why not?! It was really, really good! And easy too. I think it's about time for me to invest in a food processor though, the blender has been a little tricky with all these recent recipes, but it still does the trick.